Connors, K.; Jones, E.; Kellock, K.; Hertz, E.; Honka, L.; Belzile, J. 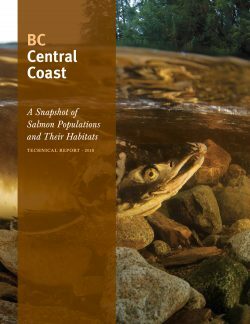 This report describes the methods and results of a project to develop snapshots of the status of 114 salmon Conservation Units on BC’s Central Coast. These snapshots of salmon status summarize the best available data for describing the dynamics and characteristics of salmon populations and their habitats in the region. This project was a partnership between the Pacific Salmon Foundation, the Central Coast Indigenous Resource Alliance, the Nuxalk, Kitasoo/Xai’xais, Heiltsuk, Wuikinuxv, Gitxaala and Haisla First Nations, and Fisheries and Oceans Canada. The report provides a high-level summary of project results. Full results for each Conservation Unit can be found on the Pacific Salmon Explorer, an online data visualization tool developed by the Pacific Salmon Foundation.